Those attending the pilgrimages are just a token representation of all that have been touched by and called to the messages of True Life in God. On the first pilgrimage in 1997, there were about 80 people from differing Church denominations representing some of the countries where Vassula had spoken. They had assembled together in the name of reconciliation, peace and unity. Since then the pilgrimages have grown in number. Nearly 800 people from 60 different countries and 15 Christian denominations came to the pilgrimage in Rome. Included within the 800, the Holy Spirit inspired 95 clergy, many of whom were Archbishops and Bishops, to attend, so as to assemble and experience a unity in diversity. At this Pilgrimage we were blessed by the participation of Cardinal Telesphore Toppo, a great supporter of the messages, Vassula's mission, and of Unity. I must also mention Msgr. Rene Laurentin, the famous mariologist and theologian, now in his 90s and blind but who never misses any of our pilgrimages. From the beginning he defended Vassula, even to the point of writing a book about Vassula called: "When God gives a Sign". Additionally, for the first time, Father Petar Ljubicic from Croatia attended our Pilgrimage. 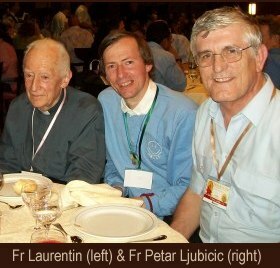 He is the priest who will announce the Medjugorje secrets to the world three days before they occur. Fr. Petar graciously gave his testimony about the power of the messages of True Life in God in a video which is now available on the internet. Vassula's mission has extended to not only Christian Unity but also to interfaith dialogue, for God speaks to all His creatures. For nine years now, there has been an interfaith presence from Bangladesh at our Pilgrimages. The Venerable Mahatero Suddhananda as well as a Muslim Imam and two Hindu's have been faithfully participating in our Pilgrimages, promoting peace and harmony in their speeches. In spite of the persecutions that True Life in God has inevitably experienced and continues to experience, the voice of Christ calling His people to convert and unite cannot be silenced. The tide of truth continues to gather momentum, as the battle for souls rages ever fiercer, and this net which Christ casts in our times must haul in its catch. Jesus said on Sept 25th 1997, 'hordes of nations will come to know Us in an intimate union'. There are now thousands of people throughout the world who have been inspired by these messages. The fact that our True Life in God group is multiplied every time the readers of the messages assemble for our pilgrimages is proof that the spirit of the Lord is present, gathering His people. Not only have the pilgrims grown in numbers, there is also a maturity of love among the group. As we read the messages and allow ourselves to be converted, we enter into that intimacy of union with Christ which can only express itself in love towards each other. One of the Orthodox priests present who has been greatly persecuted for supporting Vassula's mission said with joy, 'This is my family. I feel this is my real family'. We become aware of what oneness with Christ means. We are a family that transcends culture, denomination, race, status and all the areas that allow people to make distinctions and sow division. In order to come together in Rome, many people had to make a lot of sacrifices. In the last few years it has become increasingly difficult to obtain visas for Western Europe if you come from Africa, Asia and some other countries. It requires great tenacity and perseverance. One African priest said that he travelled 400 kilometres to get to the embassy. He then had to travel the same distance for the return journey. He had to go through this trip three times before he finally obtained the visa. He expressed his appreciation to the True Life in God family who supported him financially with the following words, ' I am writing in tears of joy and wondering at God's immeasurable love to me and my family! 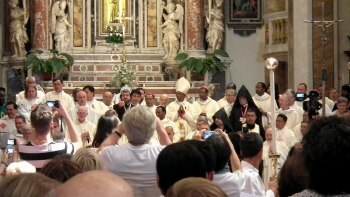 The opportunity to participate in the 8th Ecumenical Pilgrimage to Italy - Rome, I praise God for His unlimited provisions and for your large hearts of hospitality. My family, Bishop and all the Diocesan Officers express their heartfelt gratitude for the tremendous offer.' 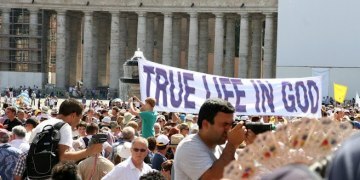 This is our True Life in God family: supporting our priests, and all those coming from poor countries. Our spiritual journey started on September 4th with the celebration of Holy Mass, presided by His Eminence, Cardinal Telesphore Toppo. All Pilgrims shared a spirit of devotion and unity and were glad to be once again sharing the "Bread of Unity". After Holy Mass, His Eminence greeted our group and expressed his approval for the gathering; clergy and laity from different denominations gathered together in the name of Our Lord to proclaim and live Christian Unity. As a token of gratitude for His Eminence's continued support towards True Life in God, Vassula offered him, in the name of True Life in God, a beautiful hand-made icon of Jesus the "Pantokrator". Cardinal Toppo thanked all of us for the beautiful gift. After Mass we departed for the Angelus in St Peter's square, followed by a visit to Tre Fontane, the site of Paul's martyrdom and burial. We also visited La Madonna della Rivelazione and the beautiful 'Basilica di San Paolo Fuori Le Mura'. The next day, September 5th, we departed for Lanciano to visit a very special site; the site of a Eucharistic miracle from the 14th century. It is a miracle which has been researched by scientists and even declared a Unesco heritage site. It is a powerful witness to anyone who doubts the presence of Christ in the Eucharist. Both the flesh and blood have been conserved over the centuries. The flesh which is in a dehydrated form has been declared as living heart muscle and the five globules of blood have the property of recording the same weight irrespective of whether there is one globule or more of them together. The Eucharist is of course central to the messages of True Life in God since Jesus calls us to celebrate around one table. Our Mass was celebrated in the main church of Lanciano by Cardinal Telesphore Toppo, and concelebrated by Archbishop Concessao and Bishop Felix Toppo. We were given a very warm welcome by the local Bishop who, impressed, said that they had received many pilgrimages over the years but this was by far the largest that they had ever witnessed. It was of course recorded in the local newspapers and TV Channels. After Mass the Mayor of Lanciano, Mario Pupillo, warmly welcomed Vassula and Cardinal Toppo, and then escorted His Eminence to San Giovanni in Venere for a tour. On September 6th, our journey again started with the blessing of a Holy Liturgy, as an Armenian Divine Liturgy was celebrated by Archbishop Mouradian from Argentina, along with several Archbishops and Bishops from the Armenian Church. After the Holy Liturgy we departed to visit Via Appia and the Catacombs. While the catacombs depict features of the life of the early Christians, they were also an inspiration to us, as the catacombs preserved the tombs of the first martyrs, witnesses of a pure and steadfast faith. In the afternoon we visited "Santa Scala"; the steps that led up to the Praetorium of Pontius Pilate in Jerusalem, which Jesus Christ walked up during His trial. The Pilgrims walked these stairs in silence, praying and reflecting on what our Lord had gone through. We also visited the 'Basilica di Santa Croce in Gerusalemme', which was built into part of the Imperial Palace of the Empress St. Helen, and then we visited the Chapel of the Holy Relics, where we saw a large fragment of the Good Thief's cross, the bone of the index finger said to be the incorruptible Finger of St. Thomas which he had placed in the wounds of the Risen Christ, two thorns from the Crown of Thorns, three fragments from the True Cross and one nail used in the Crucifixion. 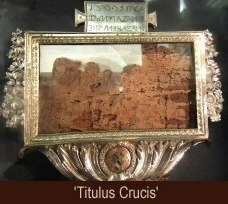 Also on display was the 'Titulus Crucis', the inscription attached to the top of the True Cross. What a blessing and a privilege to see the "precious Jewels" that our Lord used for our Salvation. * Christian unity has to take place because Jesus has prayed for it. Had he not been inspired by the Holy Spirit or had it not been his Father's will he would not have prayed for it. * Christian unity is God's work and he has to bring it about. We are only instruments in his hands. * We cannot time his plan of action. He will do it in His time and the way He wants it. Who knows, it may come as a surprise as it has happened so often in history, even recently, before our own eyes. * We must pray as if everything depended on God, and work as though everything depended on us. (I think this was the advice St. Ignatius gave the Jesuits). More clergy, inspired by Arch. Concessao's letter, shared their concern and strong desire for unity. On September 7th, after breakfast, we left in high spirits for the General Papal Audience. We were all looking forward to this. To our surprise however, our group was never announced, although we were nearly 800 people. Other groups, even those with only 6 people, were announced. We were all quite disappointed at this, for we, as Christians and working so hard for Unity, had been ignored. Rev. John Twisleton reflecting on this experience said: "The spiritual tenor of participants was evidenced from Vassula down, in the humble response to our being ignored by the protocol people in St Peter's Square last Wednesday despite the size of our group. TLIG folk do not waste their sorrows, but offer them up, an excellent reminder to all of us. May this sacrifice help progress the work of Cardinal Koch and his ecumenical office." Despite our disappointment, we did not lose our good spirits and hope. In the afternoon we had an Ethiopian mass, which was so uplifting. 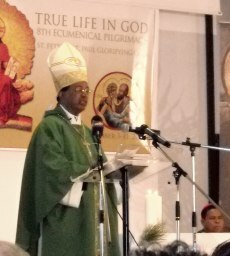 The Mass was celebrated by Bishop Markos Gebre Medhin. The songs, praises and the dance performed by the Ethiopian pilgrims gave us a feeling of joy. The Divine Liturgy was filled with praises and petitions to God. One might ask: "What is the purpose of having different churches celebrate their Mass?" The purpose is that everyone learns that all churches belong to one God and one Body; and that Christ is the Head of this Body. The Holy Spirit has lead us to live and put into practice the Unity that Christ since the time He was on earth and for which He prayed to His Father; that we may be One as He is One with the Father. This reflects as well the Unity that the dialogues between Churches talk about: a Unity in diversity, showing the riches of each Church. Bishop Punt's talk (which was printed in Issue 19 of this magazine) was indeed an inspiration to the participants. Following his talk, Fr. Damian Weber spoke about the importance of Unity and very much encouraged us to continue because God is with us at these meetings. He said that we should never fear persecution but that we should continue perseverance on the road of Unity as we do. 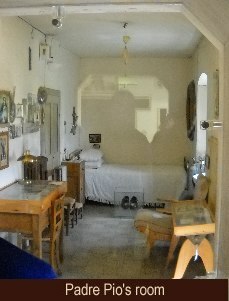 The next day we went on our second major outing to San Giovanni Rotondo where Padre Pio lived for 40 years. He has also appeared to Vassula in the past. It was a long but very beautiful journey through the Abruzzi mountains and then south along the Adriatic coast which was decked with oleander flowers. The journey took 6 hours and was a wonderful opportunity to pray and share our fellowship in our respective buses. We were able to spend four hours at his shrine which culminated in a Mass which we were privileged to have in the same Church where Padre Pio used to celebrate. Archbishop Concessao together with Bishop Toppo led the Mass. Here again we were warmly welcomed by the local priest who told us about some of Padre Pio's life. He was greatly persecuted in his life time, but the fruits of his holiness are very apparent. The next day on September 9th in the morning, we visited the Sistine Chapel and St. Peter's Basilica, followed by St. Mary Major Basilica and St. Peter in chains in the afternoon. In the evening, during our scheduled True Life in God meeting, many clergy who did not have the opportunity to express their support for Christian Unity had the chance to do so. Theodora, one of the organizers, was also asked to read a letter from Fr. Petros Berga who couldn't participate in the entire pilgrimage program due to pastoral duties at his parish in the Netherlands, yet his heart was still with us. He was so much inspired by the talks and dialogues that had taken place that upon his return to the Netherlands he came up with some suggestions on how to promote Christian Unity. On Saturday, September 10th, we went on our final excursion which was to Assisi to visit the church of St Clare and the Basilica of St Francis. Our final Mass was said there in the church of Santa Maria degli Angeli. This was a Maronite Mass celebrated in the language Jesus spoke: Aramaic, by Fr. Nabil Mouannes. It is hard to describe the joy and passion of this Mass. The Maronites in the Middle East are living through times of great unrest and persecution. The words of the Bishop captured the inflamed spirit of the persecuted Church in the Middle East. Indeed, at this time, Christians are becoming more and more vulnerable in the face of political events. As the call for unity becomes more and more urgent, we can in unison proclaim to the world a Resurrected Christ. . .